Grahame is a Swoop Customer who has recently returned from a trip to Antarctica, including the Falkland Islands and South Georgia. He has a passion for bird photography. Here he shares his knowledge of the penguins and albatross of Antarctica and their challenges of survival in a changing environment. Penguins are arguably the world’s favourite bird. From cartoons and movies, to stuffed toys and books, to feeding time queues at the zoo penguin enclosure, everyone seems to be fascinated by these cuddly little creatures that waddle about on the ice like miniature humans. 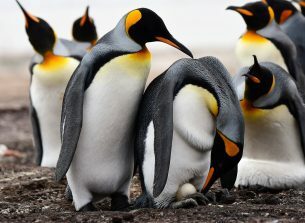 There are 17 species of penguin and, with a few exceptions, they all live in the Antarctic and sub-Antarctic, where they experience some of the harshest survival conditions on earth. 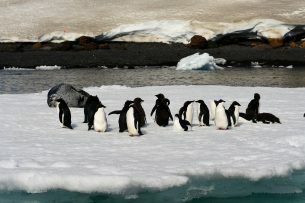 They have been evolutionary equipped to withstand extreme cold through layers of fat and a dense waterproof coat, to use their flippers (which are transformed wings) to swim through the water at amazing speed and to dive to incredible depths in their endeavours to catch krill and, of course, avoid their predators. 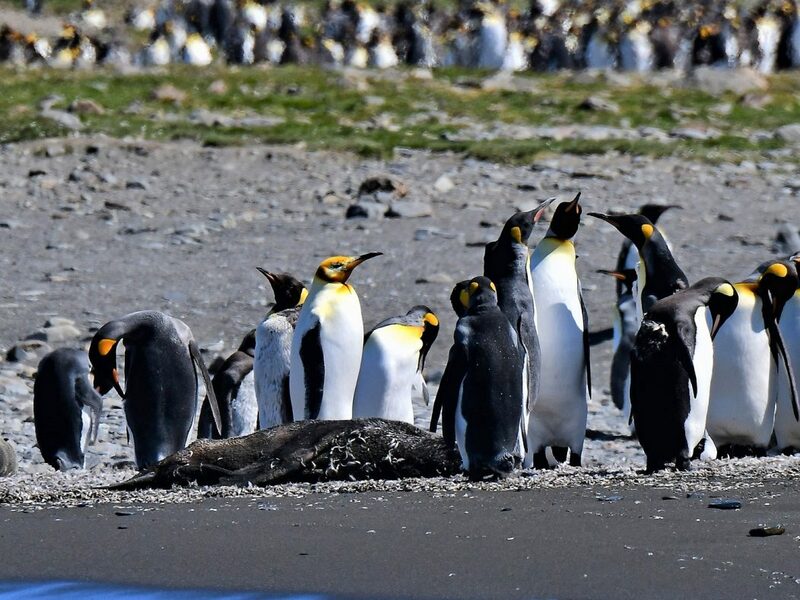 Who hasn’t seen the disturbing sight of a penguin being toyed with by a killer whale or leopard seal? Penguins migrate between their breeding grounds and their feeding grounds. 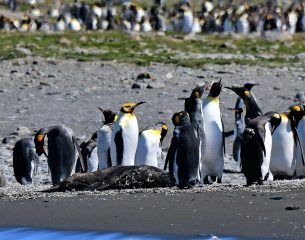 At the end of the breeding season, the colony has no choice other than to move to less harsh conditions to find food and escape the unbearable cold. Some species travel thousands of kilometres following food sources and do not return to the breeding grounds until the following season, when relatively warmer conditions and longer daylight hours provide the necessary chemical changes in the brain to produce the hormones that ignite reproduction. 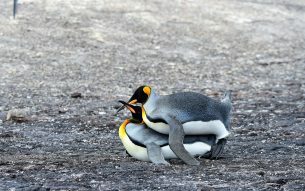 They have fascinating mating rituals which include loud male vocalisation, simultaneous head movements, head bowing and beak touching and, in some species, the male presenting small stones to the female for acceptance and confirmation of their “marriage”. 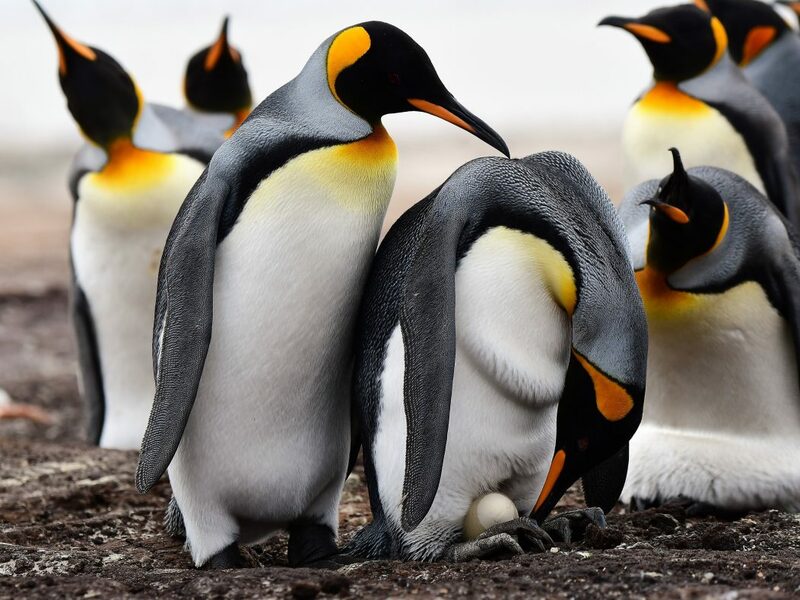 All but king and emperor penguins lay two eggs and make a nest of stone or pieces of stick or grasses. The king and emperors lay only one egg, which is balanced on the feet and covered by a warm brooding pouch. Changing sea temperature plays an important part in penguin sustainability. Rise in sea temperature affects the distribution of algae and phytoplankton on which krill feed and krill numbers having been steadily decreasing in some areas of the Antarctic. 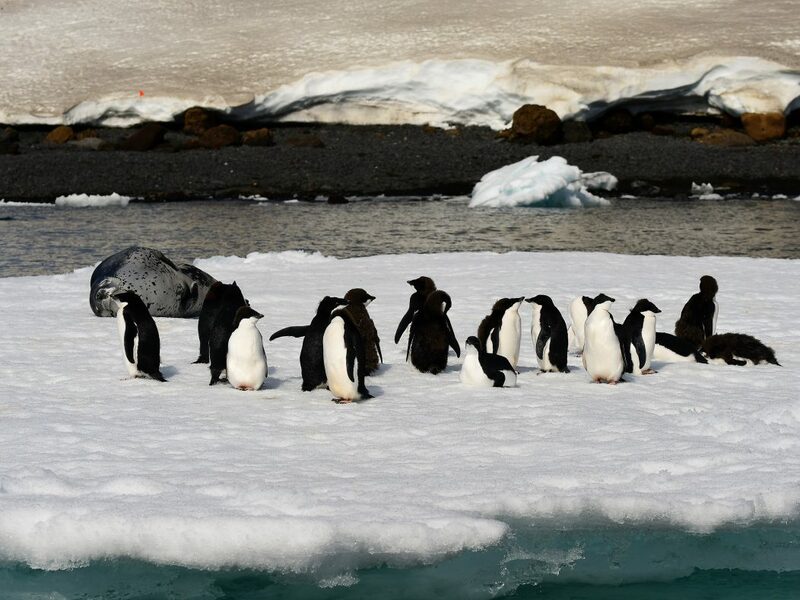 Krill also use sea ice and icebergs for shelter and the break up and melt down of ice is reducing the protection of krill and thus the major food source of many penguin species. 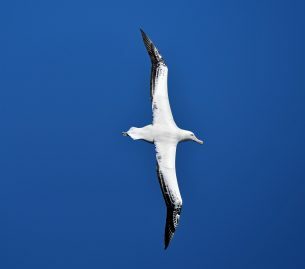 Albatross will travel many thousands of kilometres across the oceans in search of their preferred foods of squid, schooling fish, crustaceans and offal, but unfortunately their diet leads them into conflict with longline fishermen. 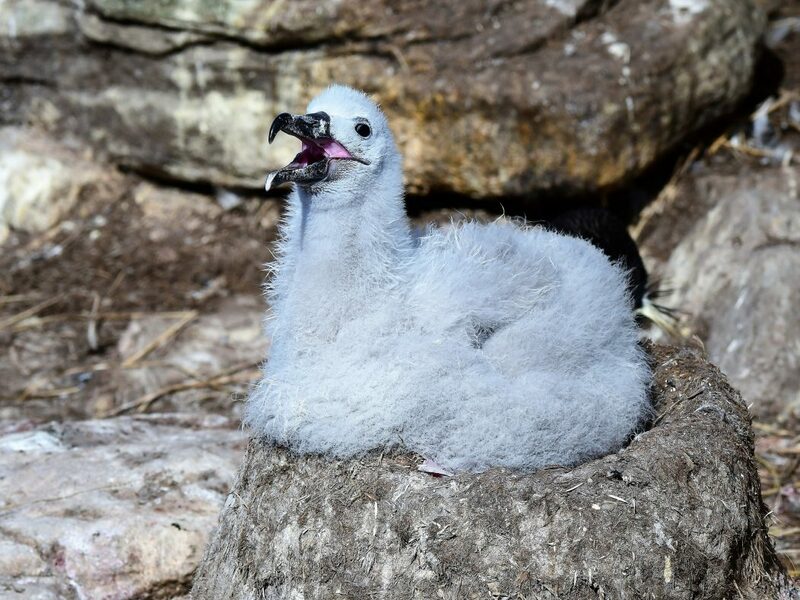 You may have seen images of Albatross snagged on baited hooks, only to suffer a horrible lingering death; many thousands of birds have suffered this fate and such fishing activity is having a disastrous affect on Albatross populations. It is estimated that some species have declined by up to 40% over the past three decades as a result of longline fishing. Fortunately, new modifications to longline fishing equipment have been introduced in the Antarctic and sub-Antarctic waters, reducing Albatross deaths in this area to almost zero. 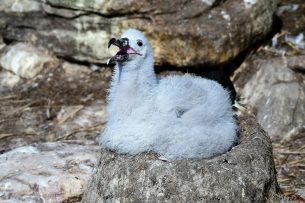 However, some countries and illegal operators are not bound by international agreements to change their fishing practices and so Albatross and their closely related Giant Petrel populations continue to suffer this threat in waters outside of the Antarctic. 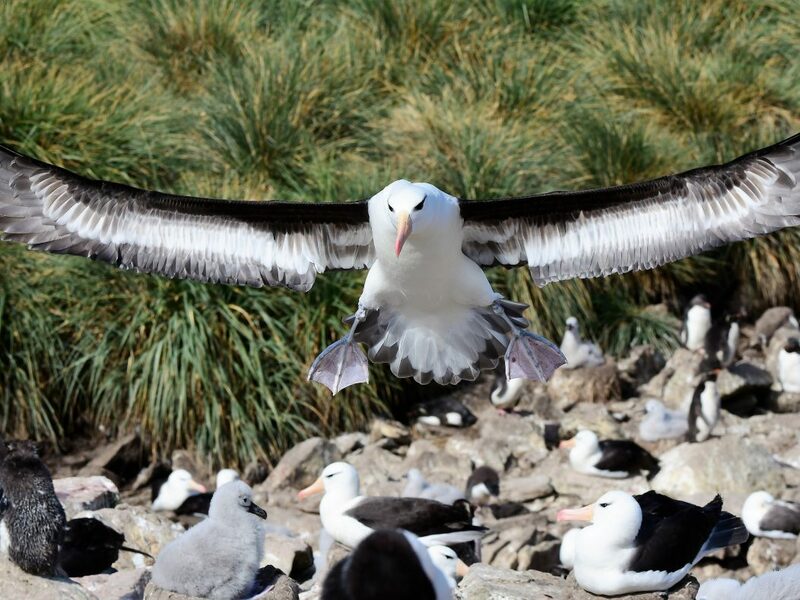 When Albatross sexually mature and return to land, they form a nesting colony. It can be both beautiful and at the same time quite funny to see these creatures, so graceful in the air, reduced to ungainly figures on the ground, where their huge folded wings and short legs (set back on their bodies for paddling) do not help with on-ground balance and manoeuvrability. They rely on fairly strong head winds and great outstretched wings to allow them to brake and settle to the ground. A misjudged landing results in the bird toppling over and hitting its beak on the ground before regaining its composure. Adding to the difficulties of landing can be a full stomach of food which needs to be regurgitated to its chick. Albatross courtship displays are fascinating and quite funny, although I doubt they would appreciate their intricate rituals being described in that way. Head bobbing, bowing and shaking, loud calling, beak wiping similar to sword fighting and moving from one large paddle like foot to the other are all features of these displays. 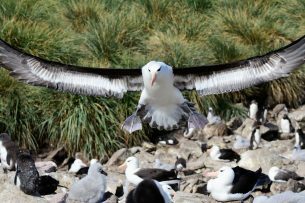 Albatross mate for life, and use these rituals to reinforce their existing relationship, as well as select their mate in the first instance. I shudder to think about what may happen to this great continent in a world that is devouring and demanding more and more natural resources, where industrial and personal waste and pollution are reaching catastrophic levels and are having a severe impact on our natural world as we know it. Sea and air temperatures are rising, glaciers and sea ice are melting, demand for food to feed the world’s population is impacting fish and other sea stocks, which has a knock-on effect of threatening the very creatures I have been writing about. Returning home from a journey like this provides an opportunity to reflect on what small part each of us can play in our daily lives to help our planet survive and continue to provide the marvellous travel opportunities and experiences we currently enjoy. Grahame’s hobby, bird photography (some might call it an obsession), stemmed from bird watching. Being able to record and recall, forever, the intrinsic beauty of birds, seemed a natural progression. Following this passion takes Grahame to many out-of-the-way places around the world. He welcomes contact from like-minded enthusiasts and discussion on his website about his photos and birds in general. Grahame lives in Far North Queensland, Australia.